Have you ever wondered how name brand company logos look like when they first came out? A company’s logo is a graphic mark, emblem, or symbol that represents the identity of that particular company which in turns aid and promote the company’s public recognition. The popularity and values of a certain company can be judge by the recognisability of its logo as well as the message and theme it holds. Apparently, many big brand companies have undergone rebranding in order to keep up with industry’s trends or to reflect the growth of the company. Some of these companies have gone through some really drastic and serious changes over the year - and they have done it over and over again! Having been introduced in 1886, it is pretty obvious that this brand would undergo plenty of changes. The main signature of Coca-Cola logo is the writing style of the words and the bright red colour. But you have to admit, when it first came out, it looks kind of dull with no impact. This brand was introduced in 1898 and is one of the main competitors of Coca-Cola. Pepsi's main trademark used to be the signature colour red, but the brand went through drastic changes in 1950 when the colour of the bottle cap becomes its trademark instead. The most extreme changes we can see in Starbucks’ logo is from when it first came out until 1987 where the signature colour changes from brown to green. After that, there is not much changes in the logo except that they sort of zoom in on the mermaid's tails for each changes. The biggest change in Walmart is in 1968 where some extra words were added. But other than that, the only changes it has gone through is the different colours and font. The logo of KFC gets shorter and shorter each time it changes where the words “Kentucky Fried Chicken” simply become the initials “KFC”. At least, Colonel Sanders’ face is still kept in the logo. The iconic bitten apple looks really different when it first debuted. In 1976, the logo portrayed Sir Isaac Newton sitting under an apple tree. Then it was replaced into a rainbow-coloured bitten apple almost immediately after that. The company probably thought the first logo was too complicated to replicate. Not much changes in Microsoft logo too except for the font style. But the first time it came out, it certainly looks like the type of font that one would use to write a party message. When Canon first came out, the logo depicts the Buddhist bodhisattva Guan Yin, which in Japanese is pronounced as Kanon but it was somehow translated into Kwanon in English. Soon after that, it was changed to Canon. The brand known for its iconic peacock has also gone through some really drastic changes over the years. The early logo of the brand was similar to the logo of its then parent company, RCA. After that, it underwent several redesigns but kept the peacock as its main trademark. 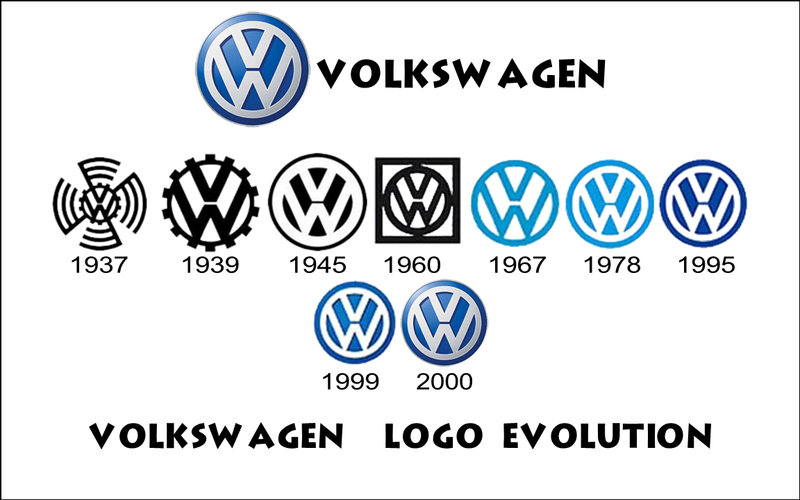 Many might not know, but Volkswagen first started out as a pet project of Adolf Hitler. After WWII, the British took control of the company and removed the graphical Nazi elements from the logo. After that, the logo has only been going through some minor tweaking. First introduced as Computing Tabulating Recording Company (CTR), the company has undergone several mergers and changes which explained the different names in the early stages. From 1947 onwards, the logo pretty much remained the same. Founded in 1906 as The Haloid Photographic Company and later changed its name to Haloid Xerox in 1958. After that, as the logo evolved, the company kept the iconic term “Xerox” which was coined by the company itself and has entered the common lexicon. Famous for its swoosh, sometimes referred to as the Nike tick, and is one of the most recognised brand logos in the world. The logo did not change much, only the “Nike” words are reposition in many different places but in the end, ends up being removed completely. Nokia got its name from Nokianvirta River in Finland and its first logo was inspired by the salmon fish in the river. After that, the brand went through several redesigns and transformed into what it is today. This Singaporean telecommunications company changed its logo this year which shows a big difference to its previous one. According to the Singapore telco, the dotted red arc is meant to represent the telco's ongoing transformation.